It's the end of March, and winter continues unabated here in Eastern Idaho. 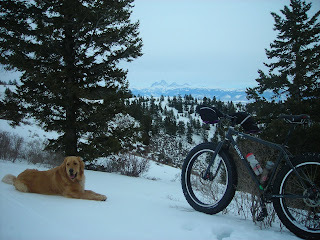 Last year at this time, Teton Valley was snow-free up into the foothills. This year, it's still being measured in feet on the valley floor. The snow hasn't even begun to melt. So, last week I decided to just go with it and cram in a bunch more "winter" outings even though my inner clock is ready for spring. My buddy Jimmy spent the week with us, and had his Polaris 700cc Dragon mountain sled along. He encouraged me to take it for an after-work ride one evening, which I happily did. Next thing I knew, I was literally on top of the 10,000 foot mountain up behind my house, watching the sunset. 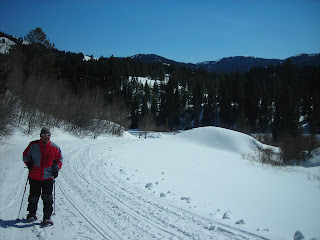 It would have taken all day to hike or ski up there, but it was only 25 minutes of aggressive riding on the snowmobile. Conditions were insanely good: a couple feet of fresh powder on top of a great base with hills, trees, meadows and expansive views. All I could think was, "wow." 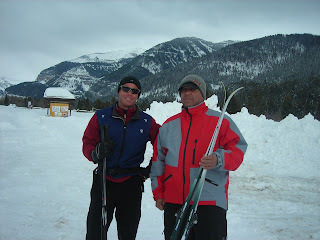 I wanted to pay Jimmy back for the sweet snowmobile ride, so the next day I took him on our signature cross-country ski trail up Teton Canyon. To fully appreciate this, you have to understand Jimmy: he owns a small business outside Minneapolis called "All-Power Sports." He's basically the only black dude in the snowmobile market, and he's been a friend of mine for 15 years (we've got some stories). He always threatens to join me on one of my self-propelled outings, so it was awesome to finally make it happen. The kicker was, he rocked it and had a great time. 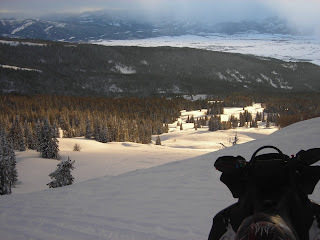 How do you follow-up snowmobiling and cross-country skiing in Driggs? By snowshoeing, of course. Jimmy was up for it, so we headed out to Horseshoe Canyon on a cold but bluebird day and trekked around for a couple of hours. 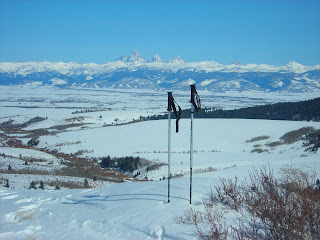 The views were huge, and snowshoeing allows you to really look around and take it all in. I could see the scenery seeping into my buddy, he was digging it. Jimmy left the next morning and Joanne was on a house-cleaning binge, so I capped off the weekend with a solo snow bike ride in the Big Holes. Another storm was beginning to roll in, but the Tetons were still visible in the distance. Bridger accompanied me, showing no sign of fatigue. He's hoping winter lasts 'til June, and the way it's looking he may just get his wish.